Microbiologists are no strangers to the fact that safety and effectiveness are crucial elements of developing pharmaceutical and personal care products. 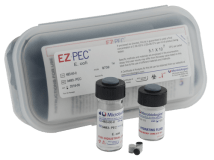 We created our EZ-PEC™ quantitative microorganisms to help laboratories conduct Antimicrobial Effectiveness and Preservative Efficacy testing with convenience and confidence. Following a few simple steps, EZ-PEC™ delivers a final concentration of 1.0 x 105 to 1.0 x 106 CFU per ml of the product being tested. It’s a simple solution that can save you time and resources while helping you meet Pharmacopeia and other standards and guidelines.